Sanyo Xacti DSC S5 introduction : Sanyo launches a new digital camera - Sanyo Xacti DSC S5. 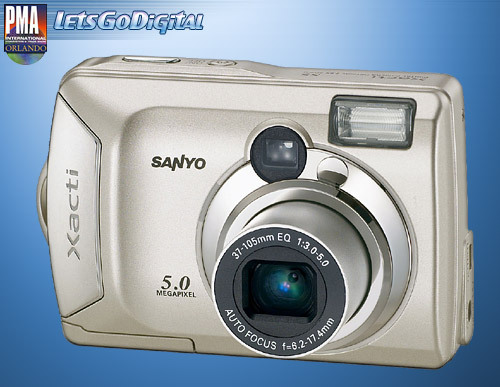 The new Sanyo S5 is a digital camera from the Xacti S serie. The camera features a 1/2.5-inch 5 Megapixel CCD and a 2.8x optical zoom made by Olympus. The maximum resolution is 3680 x 2760 pixels which should be perfect for a A3 print. A nice detail is the small mirror in front of the camera that comes in hand when making a self portrait. The Macro mode makes it possible to shoot images from a distance of 2cm. The Sanyo DSC S5 features a 1.8-inch LCD display and a 5-point AF. The camera uses a SD card for storage or the built-in memory of 16MB. More information will be updated as soon as we receive the specifications.